The Paramount Group is a group of internationally based companies with a focus on defence, internal security and correctional services. Their head office is based in South Africa. 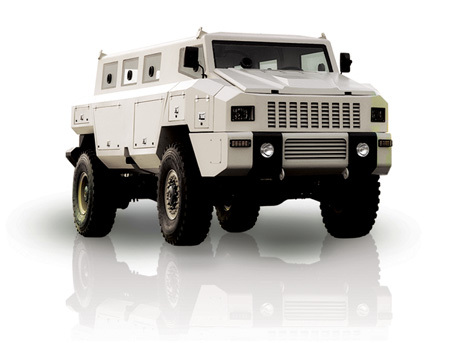 The Paramount Group specialises in the manufacture of three armoured vehicles, the Matador MRAP, the Marauder MRAP, both were unveiled in 2008) and Mbombe 6×6 IFV, which was unveiled in 2010. Paramount is currently exporting Matador and Marauder MRAP vehicle kits, to be assembled and manufactured in Azerbaijan’s. The Matador is a state-of-the-art, mine-protected 4×4 armoured vehicle in the 15 ton weight class. It boasts a brand new design, offering ultimate crew survivability and protection, and a massive payload reserve. Driven by a powerful, reliable diesel power plant and proven drive-line system, integrated with an automatic transmission, the Matador provides excellent on- and off-road mobility. The unique double-skin monocoque hull structure affords the vehicle a clean modern appearance, while providing unsurpassed protection for a vehicle in its weight class. The well-designed internal layout positions the driver and commander side-by-side in the front, with the rest of the crew in the rear, allowing for optimal communication within the confines of the vehicle. Large armoured glass windows provide excellent all-round visibility. The Matador’s “V-shaped” hull offers world leading protection against mines, with a mine-protection rating exceeding STANAG 4569 Level 4. The Matador is designed to carry a payload of almost 5 000kg, which means that the vehicle usually operates well below maximum payload capacity. This increases vehicle life and reduces maintenance costs considerably. The availability payload affords substantial potential for protection growth and/or the fitment of significant defence suites and subsystems to prepare the vehicle for a variety of missions. NBC/air conditioner and auxiliary power units can be integrated into the sacrificial bins on either side of the vehicle to increase habitability and survivability within the vehicle. The Matador is equipped with external stowage bins which enable the vehicle to carry on-board provisions and equipment for maximum autonomy. The vehicle is fully customisable to fit light and medium-calibre machine gun and cannon weapon installations, mortar firing platforms, missile launchers and command, surveillance and control systems. The powerful diesel engine and 4×4 drive-line ensures excellent off-road mobility and reliability combined with exceptional ease of use and maintenance. The standard vehicle has a cruise speed of over 100km/h with a range of up to 700km. A variety of engine, transmission and axle combinations is available, to suit market preferences. The Matador was designed with ease of maintenance in mind and as such component sourcing and manufacture are especially simple. This allows for the cost-effective production and support of vehicles in a number of different locations across the globe. The Matador’s cutting-edge, double-skin monocoque hull structure affords world-class spaced-armour all-round protection and survivability against kinetic energy projectiles up to STANAG 4569 Level III for the crew compartment. This is better than level B7 protection and comes as standard at a kerb weight of less than 10 800kg. Crew seating arrangements are specifically designed to maximise crew survivability during extreme accelerations experienced when mines are detonated. The main hull structure is comprised of three self-jigging plates arranged in the proven, reliable deep V-shape. As a result, the Matador can withstand the blast of a double anti-tank mine at any point beneath the hull and a triple anti-tank mine under any wheel. This amounts to a mine-protection rating greater than STANAG 4569 Level 4. Enhanced ballistic and IED protection kits are available as custom options. Matador is field-repairable after a mine-blast, with spring and axle replacement possible in less than an hour.